Last episode, Cersei finally got what she deserved, you can’t throw out other people’s sins when you have all the skeletons in your closet. Since we are all dying to see Cersei rotting away in a cell, the show does not disappoint. They are trying to get Cersei to confess but she won’t she keeps thinking that she is the Queen and can threaten people. Well her little minion comes to visit her, he tells her that her Uncle has come back to the city and has taken over the small council. Tomman well he is useless, he is so upset about what happened to Cersei and Margaery. He also tells Cersei that she can get out faster if she confesses otherwise she is going to trial. Did anyone else enjoy watching Cersei trying to drink the water off the floor because they won’t give her any. 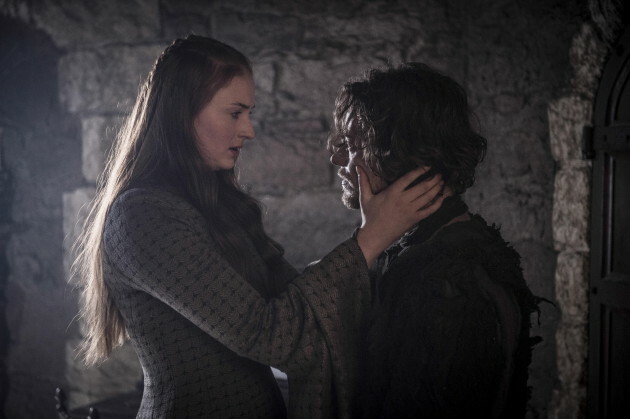 Well Sansa is really mad at Theon since he told Ramsey that she was trying to escape. He told her that he did it to protect her, because he escaped once and Ramsey cut him to pieces, he did not want that for her. While Sansa was yelling at Theon, he admitting the fact that he didn’t actually kill Bran and Rickon, but farm kids instead. Sansa wants to know where her siblings are but Theon does not know and he runs out of the room. Now Sansa can be happy with the knowledge that her younger brothers are probably alive somewhere, now I am sure she is going to try to escape. Ramsey does not understand why his father is not attacking Stannis, since he knows The North better than Stannis. Roose also knows that it is almost impossible to get an army through all the snow. But Ramsey says he does not need an army just 20 good men to attack Stannis’s army. Does Ramsey always have to do that I am pure evil smile of his, does that smile not creep anyone else out? 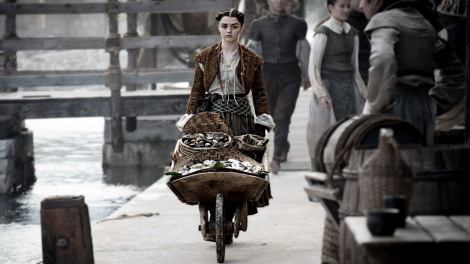 Arya is now Lana a young orphan girl who sell oysters, she is sent down to the fish market to basically look around. While she is there, she sees a gambler who basically gambles on ships. He makes more money if the captain of the ship dies and so does the captain. If the gambler does not give the money to captains family, then the captain died for no reason. Arya’s job is to keep watching him, she is to get to know his as well as she knows herself. Her buddy gives her a vital to give the gambler eventually. Now the other girl at the House of Black and White does not think Arya is ready but apparently it doesn’t matter to the Many-Faced God if she is or isn’t. Now that is BS, basically it doesn’t matter who dies as long as someone dies. Tyrion and Sir Jorah are standing before Dany, she wants to know what to do with them. We all know that Tyrion has a great way with words he convinces Dany that he might be of some help by advising her, he was a great Hand of the King. Tyrion also gets Dany not to kill Sir Jorah, but to exile him again because killing those devoted to you not help bring devotion. 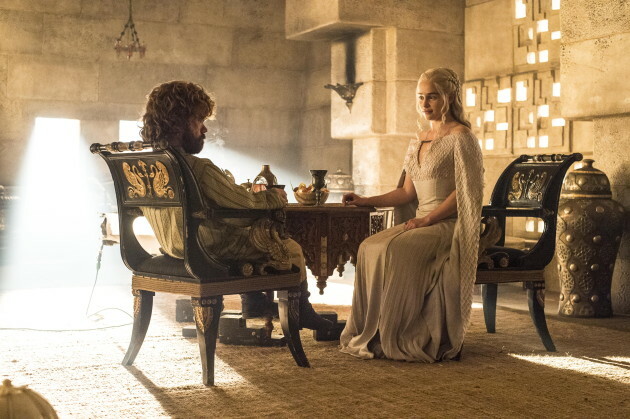 Tyrion tries to tell Dany how things are done in Westeros because if she is going to rule she needs to understand the families. If she is to achieve her goal of breaking the wheel then she needs to know whom she is dealing with. It looks like Tyrion will be advising Dany, well this is going to be interesting. Jon and Tormund make it to the wildlings where they do everything they can to convince them to go south of The Wall and to fight with the Nights Watch when the time comes. With some effort they are able to convince many of them to join. While they wildings are getting to boats so they can travel to The Wall they are attacked by White Walkers and Wights. Ok, I don’t know about the rest of you but my heart was in my throat for most of this scene, also I don’t remember how many times I said run. There was a lot of death in this scene, as with every battle scene, we lost an awesome new Wilding female who might have been able to replace Ygritte. Giants do not seem to be affected by Wights, so the Giant is very useful, also did anyone else notice them not crossing the water. Does this mean that water stops them? If that is the case, people start digging because they just have to build a really big moat between them and The Wall. Let’s talk about this episode, while we are all happy to see Cersei in the jail getting what she deserves and we are all happy Dany and Tyrion are going to be buddies. The ending is the part that stuck with most people. That was crazy, seriously I see one of them and I am going to the other way. 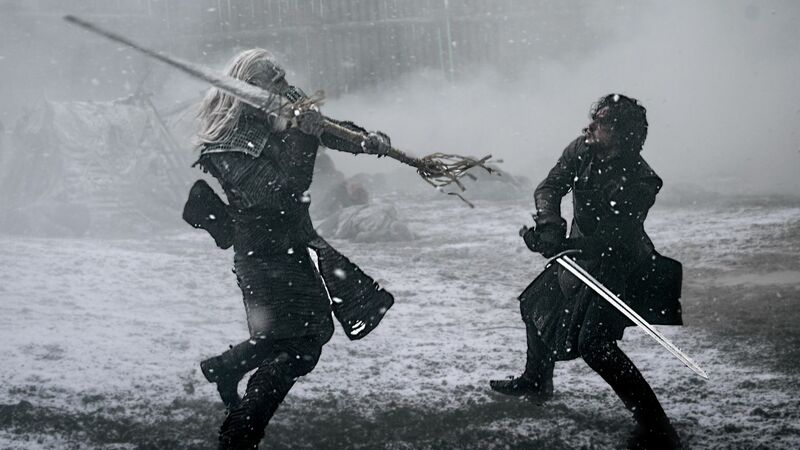 It’s great that we know another way to kill White Walkers with Valyrian steel, which means the whole 50 that exist in the world need to find their way to the Nights Watch. Also the King of the White Walkers was all like now what at the end. He was basically thanking them for adding to his undead army, seriously people cannot die because they will just turn them into Wights and quickly too. I am not looking forward to reading those battles in the books or seeing anymore of them on the TV, especially since I am not a zombie fan. Posted on June 8, 2015, in Game of Thrones, TV Show Reviews and tagged Game of Thrones, Game of Thrones Hardhome, Game of Thrones Hardhome Recap, Game of Thrones S5E8, HBO. Bookmark the permalink. Leave a comment.